…The authority hitherto possessed by my mother Ka‘ahumanu II. Until her decease is now transferred to my other mother (Miriam Kekāuluohi) though Victoria Kamehamalu II is her superior, but still under my direction. Honolulu, June 8th, 1839 by Kamehameha III. Other important events during Kekāuluohi’s tenure were the threats to Hawaiian sovereignty by the French and English. 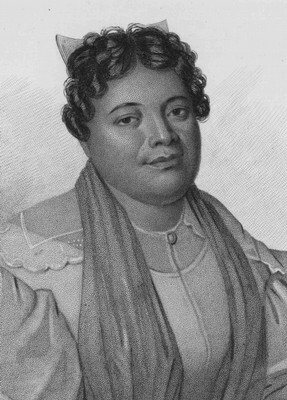 Soon after assuming her office in 1839, the French threatened war if Kamehameha III did not provide special privileges to the Catholic missionaries, repeal liquor laws, and grant generous concessions to French citizens in Hawai‘i. Then, in 1843, the infamous Charlton land claim resulted in the temporary loss of Hawaiian sovereignty when Lord George Paulet intervened and took possession of the Hawaiian Islands on behalf of the King of England. Richard Charlton was the British Consul in Honolulu who, in 1840, claimed valuable land based on dubious documentation and authority. Kaleimamahū was a Hawai‘i Island chief. Kaheiheimālie was a daughter of Ke‘eaumoku and Nāmāhana, sister of Ka‘ahumanu, mother of Kīna‘u. Charles Kana‘ina (ca.1821 – 1845) – ca. 1821 Kamehameha II gave Kekāuluohi to his friend Charles Kana‘ina, who was a chief of low rank. William Charles Lunalilo (1834-1874) elected king in 1873, died 1874.